Kenneth P. Brophy of Woburn, November 17th. Beloved husband of Elsie M. (Upton) Brophy, at seventy seven years of age. Devoted father of Karen Harris, her husband Jeffrey of AL, Ret. Major U.S. Army, Kenneth P. Brophy Jr, his wife Erin of IN and Michael U. Brophy of Lowell. Dear brother of Catherine LeTrendre of FL and the late Barbara Greene, Albert, William, James, Ralph, and Robert Brophy. Cherished grandfather of Travis, Keighly, Carson Harris, Kristina Morrow, Hannah, Noah, Gwendolyn, Simone and Wesley Brophy, and great grandfather of Gabriel, Elijah, Luke, and Freyja. Also survived by many loving, nieces and nephews, great and grand. A Funeral will be held from the Lynch-Cantillon Funeral Home, 263 Main Street, Woburn on Saturday, November 24th at 10:45 a.m. followed by a Funeral Mass in St. Charles Church, 280 Main Street, Woburn at 11. Relatives and friends are respectfully invited to calling hours, Saturday morning at 8:30 a.m. PRIOR to the Mass. At the family’s request remembrances maybe made in honor of Kenneth to St. Charles Church, 280 Main Street, Woburn, MA 01801 or Edith Nourse Rogers Memorial Veterans Hospital, 200 Springs Rd., Bedford, MA 01730. Kenneth P. “Ken” Brophy passed away at the Edith Nourse Rogers Memorial Veteran’s Hospital, Saturday evening November 17th. The beloved husband of Elsie (Upton) Brophy he was seventy-seven years of age. Born and raised in Somerville, Ken was one of eight children born to the late Albert C. and Miriam E. (Fish) Brophy. Raised and educated in Somerville Ken was a graduate of Somerville High School. While in High School, Ken began working at the Harvard Coop, which was a position he held for several years after high school, later going to Belmont Country Club, where he secured the position of Maintenance Director, where he remained for the next thirty five years, till his retirement. While visiting a restaurant in Cambridge with a couple of friends met a lovely group of young ladies from Woburn. Yes, that was the beginning of journey that spans close to six decades. In 1963 they married, and settled here in Woburn, where they have remained. 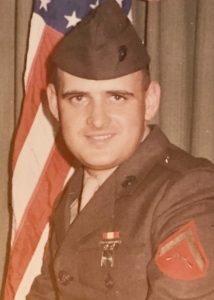 In 1967 Ken had enlisted in the United States Marines, where he proudly served his country for several years during the Viet Nam War. Bringing their daughter and two sons into the world, he was totally immersed in his family. From the mountaintops of Vermont, New Hampshire and Maine to the Beaches, particularly at York Beach, and down the coast, the family had some terrific adventures! Panning for gold, climbing, hiking, skiing, fishing and hunting. They did it all! Summers were spent at their lake cottage, in Georgetown. With all of the fishing expeditions there at the lake, Ken had the award for catching the largest, large mouth bass ever!! This record catch still holds today! Ken, not one for idleness, had become involved with Flea Markets. He caught on to the buying and selling of goods, and was quite successful at it. And enjoying every minute! Not only did he enjoy it but he also never kept anything hanging around; if he didn’t sell it, he gave it away to someone in need and was never left in their cellar! Over the years, he and Elsie enjoyed travelling. Be it out to visit their children and grandchildren whom he adored in the different states, going down to Florida, over to Bermuda or to Las Vegas, they shared many wonderful times. Ken was not a man who could sit still for very long. If there was something that needed to get done, he was on it, from start to finish. A good, faithfilled gentleman, Ken was always there for family, friends and strangers alike. A smile, big hug, or a prayer, Ken provided whatever that was needed. Sadly, in addition to his parents, Ken was predeceased by six of his siblings, Albert, William, James, Ralph, Robert Brophy and Barbara Greene. Ken is lovingly survived by his dear wife Elsie of fifty six-years, his loving children, Karen Harris, her husband Jeffrey of AL, Ret. Major Kenneth P. Brophy Jr, U.S. Army, his wife Erin of IN and Michael U. Brophy of Lowell. Dear brother of Catherine LeTrendre of FL. Cherished grandfather of Travis, Keighly, Carson Harris, Kristina Morrow, Hannah, Noah, Gwendolyn, Simone and Wesley Brophy, and great grandfather of Gabriel, Elijah, Luke, and Freyja. Also survived by many loving, nieces and nephews great and grand. A Funeral will be held from the Lynch-Cantillon Funeral Home, 263 Main Street, Woburn on Saturday, November 24th at 10:45 a.m. followed by a Funeral Mass in St. Charles Church, 280 Main Street, Woburn at 11. Relatives and friends are respectfully invited to calling hours, Saturday morning at 8:30 a.m. PRIOR to the Mass. At the family’s request remembrances maybe made in honor of Kenneth to St. Charles Church, 280 Main Street, Woburn, MA 01801 or Edith Nourse Rogers Memorial Veterans Hospital, 200 Springs Rd., Bedford, MA 01730. A Funeral will be held from the Lynch-Cantillon Funeral Home, 263 Main Street, Woburn on Saturday, November 24th at 10:45 a.m. followed by a Funeral Mass in St. Charles Church, 280 Main Street, Woburn at 11. Relatives and friends are respectfully invited to calling hours, Saturday morning at 8:30 a.m. PRIOR to the Mass. At the family’s request remembrances maybe made in honor of Kenneth to St. Charles Church, 280 Main Street, Woburn, MA 01801 or Edith Nourse Rogers Memorial Veterans Hospital, 200 Springs Rd., Bedford, MA 01730. Elsie, Karen, Kenny, and Michael – Sorry for your loss; he was special. Our thoughts and prayers are with you on the passing of your husband. Mom and I will remember his beautiful smile, his lovely bright blue eyes, and his gentle way with the dog. What a wonderful fellow he was! Elsie – Please know you are in my prayers and thoughts. I will truly miss seeing both of you at the VA and that beautiful smile of Kenny’s. God bless you. Carol Ann and Rocky Ruggiero. Hi Elsie, So sorry to hear about Kenny. My thoughts and prayers to you and all your family.